How Do I Inform a Child? 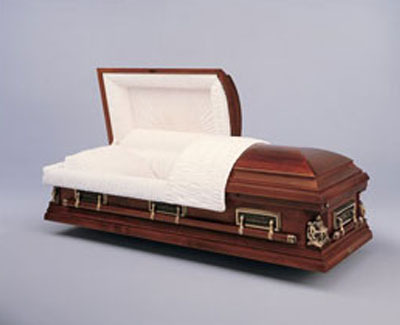 Choosing the right coffin or casket for your loved one can be difficult. Here at Russell Brothers, we guide you each step of the way ensuring you find the right product for your loved ones needs. Our caskets range from simple, affordable options, to more elaborate designs. Choosing the right coffin or casket for your loved one can be difficult, but rest assured Russell Brothers Funeral Directors will guide you through the decision-making process and find the right product for their needs. Our coffins and caskets range from simple, affordable options, to elaborate designs made of steel and featuring plush trimmings. Being Melbourne funeral directors, we believe in supporting Victorian manufacturers. Most of our coffins and caskets are made in Oakleigh and Ballarat, largely from renewable resources. 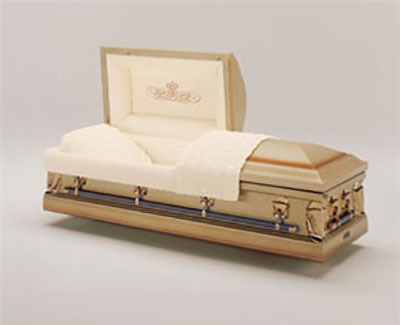 All coffins and caskets come with high-quality drapery, handles and fittings. Please contact us if you are interested in finding out about our eco-friendly choices. The Tasmanian Oak veneered flat-lid coffin features a neat interior trim and comes in a light shade of oak. This flat-lid coffin features a wide matching mould on top and bottom and is finished in full wood grain glass. The Swan Rosewood is our most frequently selected coffin. It is finished in full gloss rosewood with drapery and handles that compliment the colour and style. The Swan Rosewood is also available in a white gloss finish. Featuring a double raised lid, this coffin is finished in a golden oak colour. The three panels on each side, golden ornaments and timber handles enhance the overall appearance. 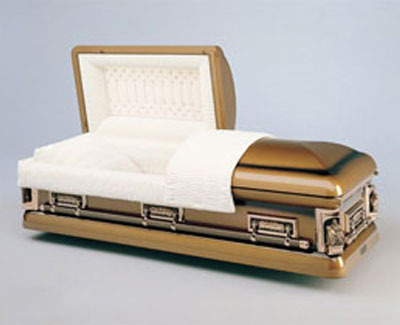 This coffin is made of veneered timber. It is unique in the coffin range in that it has a high-domed lid, which is fastened by four clips. The sides are plain and are set-off by a heavy mould around base. The hardware and drapery are of superior standard. This coffin features a domed lid and plain sides. Carved into the lid is a large cross, which makes this coffin very meaningful and symbolic. This double raised lid, solid timber coffin has scallops and buttons on each corner to set it above the rest. The octagonal end styling sets this casket apart from others. The exterior of carved timber gives this casket a very distinctive styling. 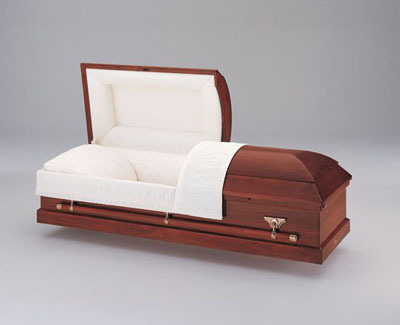 The interior portrays a richness and quality, which enhances the overall style of this casket. This casket is manufactured from Meranti. The finish is a full gloss white lacquer. It is octagonal in shape and features a high-domed lid. The interior is made from a fine soft satin and the handles enhance the appearance beautifully. This high-quality, 20-gauge metal casket offers exceptional value for money. The casket is not covered by a warranty, which is reflected in the price. It offers a prestigious appearance, with a stationary bed, quality inside trim and metal handles. Please note: metal caskets are unsuitable for cremation. This 20-gauge steel casket features Batesville’s four-point protection package, adjustable bed and mattress, interior chemical protection against rust and corrosion, shaded finish, pin striping, safety seal, swing bar hardware and a memory safe drawer. Please note: metal caskets are unsuitable for cremation. This solid timber hardwood casket has a Victorian cherry stain and hand-rubbed high gloss finish. It features a stationary bed, swing bar hardware and memorial record system. This 18-gauge steel casket features Batesville’s four-point protection package, an adjustable bed and mattress, interior chemical protection against rust and corrosion, shaded finish, pin striping, safety seal, swing bar hardware and memory safe drawer. Please note: metal caskets are unsuitable for cremation. This hand rubbed, high-gloss finished maple casket offers the ultimate in craftsmanship and attention to detail. It includes an adjustable bed and mattress memory safe drawer, wood bar handles and interchangeable corner options. A Last Supper picture panel can be inserted into the casket lid to make it meaningful and symbolic.